Download all the NoRest presentations here! http://cycleweb.no/wp-content/uploads/2013/08/CYCLElogo1.png 0 0 tyd http://cycleweb.no/wp-content/uploads/2013/08/CYCLElogo1.png tyd2016-12-15 22:53:242016-12-15 22:53:24Download all the NoRest presentations here! 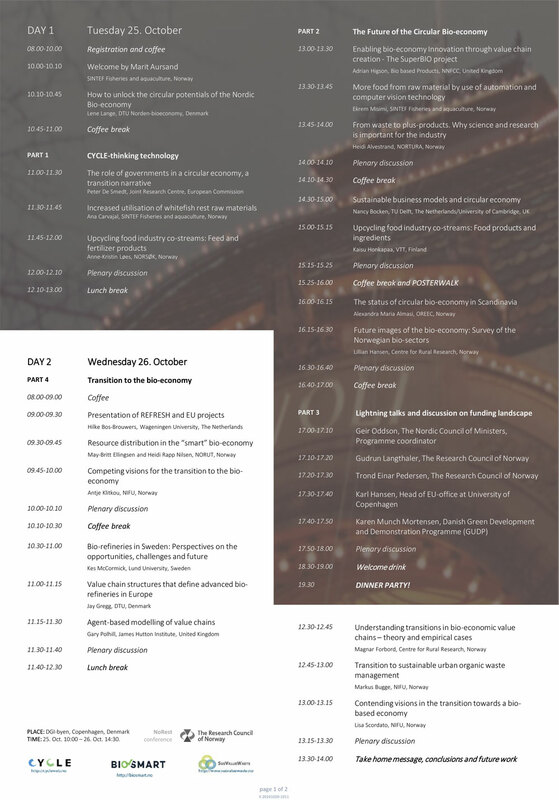 CYCLE has joined forced with two other BIONÆR projects – SusValueWaste and BioSmart in order to arrange a conference that emphasises on cycle thinking in technology, foresight exercises and transitions related to different aspects of the bio-economy and future challenges and possibilities for both researchers and industry. A combination of keynote presentations held by carefully selected speakers, short lightening speeches, and poster presentations from research projects, industry, government and relevant EU or Nordic funded research projects provides an interesting and interactive program. Developing a future bio-economy has become a key goal for Nordic policy-makers, across Europe, and around the world. The bio-economy is considered critical for several reasons: the need for sustainability of resource use, the growing demand for both food and energy, and the need to decouple economic growth from environmental degradation. This conference put emphasis on cycle thinking in technology, foresight exercises and transitions related to different aspects of the bio-economy and future challenges and possibilities for both researchers and industry. Sign up for the conference! 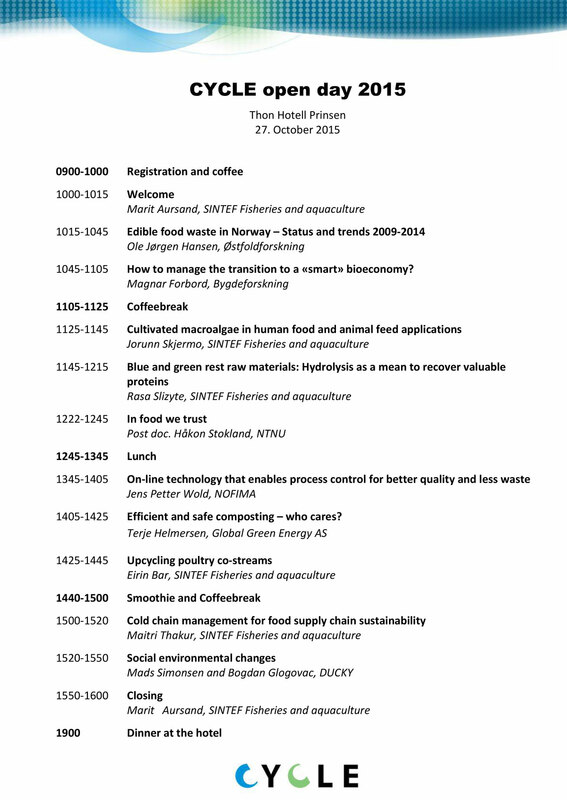 Read the presentations from the Cycle seminar at Clarion Hotel & Congress Trondheim. SINTEF has developed the world’s first robotic concept for harvesting of chicken fillets from the carcass. The Gribbotusesmachinevisiontotakeimagesofthe chicken, a robot arm for manipulation and a compliant gripper that is able to harvest the fillets from the carcass with a relatively optimal yield. The Lerchendal conference 2015 was titled “Change agents for green growth”. Climate change, destruction of ecological diversity and globalization poses a number of majorsocietal challenges. Changes are needed in everything from the development of sustainable cities for renewable energy solutions. Marit Aursand presented the Cycle project, talking about the projects goals, plans and results. In relation to this conference, a new video presenting the project has been made. Watch it here. Manual harvesting is repetitive and can be a tedious job and it requires special skills to perform it. So far none has made a machine to automate this operation. But what if a robot could do this job? – The Gribbot aims to automate manually based harvesting of fillets from the carcass in the poultry industry. Forskningsrådet skriver om CYCLE-prosjektet og andre BIONÆR prosjekters visuelle kommunikasjon strategi. Det nordiske forskningsprosjektet CYCLE tar i enda større grad i bruk video som formidlingsplattform. På hjemmesiden www.cycleweb.no kan du se og høre prosjektleder Marit Aursand fortelle om hvordan industri og forskere skal samarbeide om å optimalisere matens vei fra åker eller hav, og helt fram til butikkhyllene. Loss and waste is a large problem in food industry as well as private households, which is why the CYCLE project aims to obtain total utilization of raw material from fish, chicken and vegetables. The focus in CYCLE is eco-cycle thinking and sustainable technological solutions for an efficient and profitable food process industry. This include value-chain-integrating disciplines, such as food safety, sustainability, sensor and automation technology, logistics, bioprocessing technology, and socio-economics. The main goal of CYCLE is to improve resource utilization, both loss and waste, in the food chain of both agriculture and marine sector. The research project has established an industry arena with the partners from both food and fish industries and their retailers, and feed, energy, logistic and equipment industry.